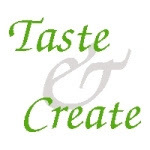 Taste & Create is a food blogging event in which you are randomly paired up with another particpant, and each of you try a recipe from the other’s food blog. For Taste & Create V, We [Heart] Food was paired up with Stephanie from a whisk and a spoon. As soon as the partner list was posted, I rushed to check out what delicious dinner item or side dish I would be preparing for the event. Oops! Turns out Stephanie is big-time into posting delicious looking cakes and sweets, items I’ve never tried making! (I don’t bake.) After perusing the site a bit more, and checking out recipes for both sweet and savory items, I decided to go for broke and chose what I thought was the most delicious-sounding recipe on the site: Cranberry Bliss Cupcakes. 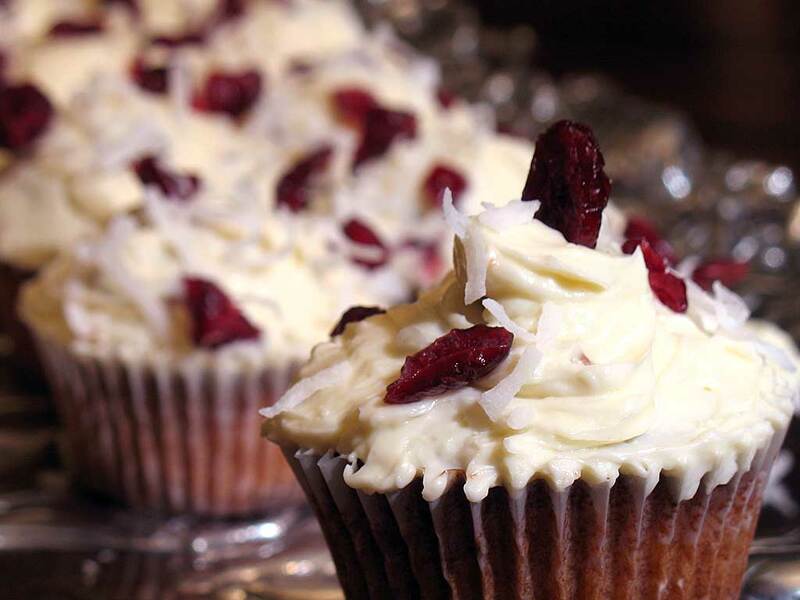 The cupcakes are Burnt Butter Brown Sugar, filled with cranberry sauce, and frosted with a white chocolate ganache with dried cranberries and toasted pecans. Sounds delicious, right? With the exception of my overbaking the cupcakes (dry! thank goodness they were filled…) they were very tasty — the frosting was a *big* hit. Lesson 1: Ingredients really matter in baking! Usually substitute margarine or some other spread for butter? Guess what? “Burnt Butter” needs … butter. Not some oil-based spread. First off, it won’t brown, and secondly, once it melts, it ain’t coming back to a solid any time soon. Lesson 2: Don’t rush it! I figured I could whip these up before dinner, take the pics, and be done with it. Bzzzzt, wrong. Not only did I have to throw in an extra trip to the store mid-recipe to buy butter (see Lesson 1), my cranberry sauce filling never gelled — why? Instead of letting it cool to room temperature first, I just stuck it right into the fridge after removing it from the pan. Now, this ended up being a happy accident; we just filled the cupcakes with whole cranberries that were soaking in the simple syrup: they made a satisfying liquid explosion when you bit through the cake. Lisa and I both loved that. Lesson 3: Watch the clock! The yang to the yin of Lesson 2… I left the cupcakes in the oven just a few minutes too long and they ended up pretty dry. I’m used to just being able to eyeball something to check for doneness — in this case I should have just used a timer. Lesson 4: Essential Baker’s Equipment: A blow-dryer. You read that right! The ganache was nice and fluffy when it only had the cream and white chocolate, but as we added in the soft butter… it broke. In a big way. It turned into what looked like a bowl of cottage cheese — disaster! We tried everything… whipping it more, adding more butter… oy. Nothing worked. We stuck it in the fridge hoping that might firm it up a bit, but when we tried whipping it then, the entire blob ended up stuck INSIDE the whisk, and looked like a frozen block of cottage cheese that was weeping milk. Sad, sad, sad, and ruined… or so I thought. I did some web searches and found others who had the same situation, and someone presented what sounded like a strange fix: Use a blow-dryer to heat both the bowl and the frosting sludge for just a few seconds in each spot while you continue to whisk. Sounded crazy, but we were desperate. I was on whisk duty while Lisa manned the dryer. At first it just seemed to cause the huge glob to separate even more, but after a minute or two… whoa! It’s coming together! And of course, once it reached the right consistency, it stayed that way. So — in spite of all the “issues” I ran into, I was pretty satisfied with the results, especially with that delicious frosting. The recipe can be found here, for those of you with better baking skills than yours truly. Did you tell them you brought these cupcakes to a professional baker? You just *had* to bring that up… anyway, she was impressed with the frosting, and said that baking is way harder than cooking. Even if it was a lie, it made me feel a little better. You’re too hard on yourself. I loved the filling, and she wasn’t lying about the frosting… it ruled! I think if you would have pulled the cupcakes out about 5 minutes sooner they would have been totally fine. This entry was posted on Saturday, January 12th, 2008 at 12:40 pm	and is filed under Desserts. You can follow any responses to this entry through the RSS 2.0 feed. You can leave a response, or trackback from your own site. thanks for giving these a shot! they look like they came out pretty well, and you have some good tips there. i knew that if anyone tried to make these, they’d be thrown by the frosting. mine split, too but i was able to get it back together with a quick chill and an extra blob of butter…the hair dryer is a good suggestion, and i never would have thought of it! Okay, I NEED to see video of you and Lisa blow-drying your cupcake frosting. Please post ASAP. Oh, and send me a cupcake while you’re at it! Despite the misadventures, they look awesome!!! Those look awesome! Hard to believe you don’t bake regularly. I had a blast reading this post!! BTW…these cupcakes look amazing!